Pre-made selections of our top quality Boars Head brand (store-roasted) turkey breast, custom cut roast beef and Virginia ham on a variety of breads and kaiser rolls – with cheeses, lettuce and tomato – halved, party picked and garnished with either pickles or seedless grapes – available either with the condiments already on, or with sides of Hellmann’s mayo and Boars Head mustard – attractively arranged on a covered plastic platter – at a price that is LESS than if purchased separately! 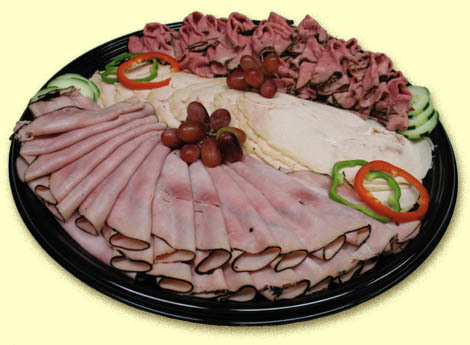 Classic deli trays ~ beautifully arrayed sliced meats and cheeses, with everything you will need to build your own CIRCLES' sandwiches! Includes breads, lettuce, tomato, mayo, BH mustard, one specialty mustard, our own Russian dressing, pickles and/or ripe olives. Portion size is a hefty 5 ounces, larger than our regular 4 ounce sandwiches, so you are sure to not run out! Man does not live by bread alone! 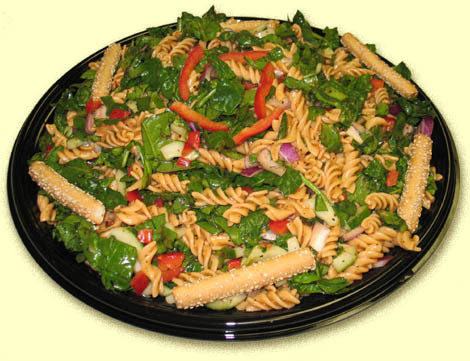 We create topical salads every day to serve our loyal and demanding Take Out Salad Bar customers. A good salad not only complements a great sandwich but offers a satisfying alternative to those in search of vegetables. We offer a host of salad choices, including straight greens, tossed salads, macaroni, potato, spinach, pasta combinations galore - as well as scores of composed salads. Reduced calorie and fat-free dressings are always available. Please call and talk to one of our "greens" people about your needs. ( Our goal is not to sell salad - Our goal is satisfy your needs, and the needs of your guests.) We suggest a quarter to a third pound serving per person, generally. Prices vary by volume and salad type. We say "toe-may-toe". 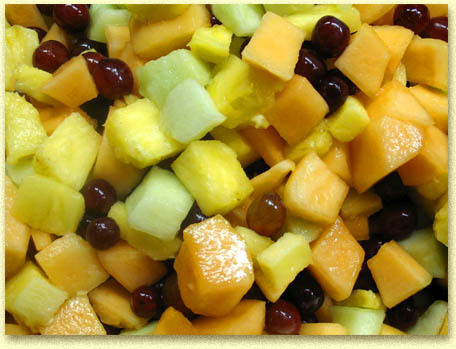 Field-ripened canteloupe, honeydew melons, golden pineapple and washed seedless grapes, heaped on a covered platter with a clear dome lid: a welcome addition to any gathering and complements even the fussiest diet! Available every day, our made-from-scratch, original recipe soups taste so good they will make you happy! Available by the gallon ( for your stockpot or immediate or future use) or in our 12 ounce individual serving cups. Buy the whole batch at a significant discount - you'll love the left-overs! Imported penne pasta and private stock Cabot Vermont cheddar combine to make our Mac & Cheese a daily special occasion! We bake ALL of our baked goods on the premises. Our muffin selections are hand-made daily as are our original recipe to-die-for chocolate chip walnut cookies. We finish par-baked water bagels fresh in our ovens and we proof and bake authentic Vie de France butter croissants every day, fruit-filled, chocolate, plain, and honey whole wheat. And we make some of the nicest baked good PLATTERS anywhere. For all occasions: breakfast, dessert, party, or condolences. Prices vary by selection and quantity. Please consult one of our customer service specialists for expert advice! Your satisfaction is assured. 20-plus years of baking experience you cannot get at Sam's Club, brother!